Hi! This is my first post. I just recently bought my kids some hermit crabs when we were on vacation in Alabama. We wanted to be responsible hermit crab owners so I read up on them when we got them home and completely changed their crabitats and what we do for them. We bought larger crabitats, temp gauges, hygrometers, switched to sand instead of the rock they came with, added salt water pools, etc. I had no idea how much the crabitat that they came with was not the best situation for them. Anyways, one thing I also found out was how social they are. At the time, I only bought one crab each for my kids. We've had them a few months, but one of our crabs didn't make it. The kind we bought were Ecuadorian hermit crabs. All I can find around where I live are purple pinchers. My kids would really like more E's, but I'm having a hard time finding them. 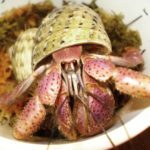 I came across livehermitcrabs.com, but the website looks kind of strange and I couldn't find out how much shipping was so I'm a little nervous to place an order. I also messaged them and never received a response back. Can anyone vouch for the website or know of other places I can find some E's? Thank you! We have a several hundred page thread full of bad reviews for that website sitting around here somewhere. Mostly just people never getting their orders and having to fight for refunds. In the U.S., Ecuadorians are almost always only brought in by chance with the PPs. You’ll have to keep looking around at local pet shops to see what they have. Eventually a few will pop up in a shipment. Try Petco. The only E's ever available in my area were found there. We've tried Petco and Petsmart, but both only listed Coenobita clypeatus on the signs and looked like all purple pinchers so we didn't look very hard. I didn't know that some E's may show up with them sometimes so we'll take a closer look at them. Does anyone know of a reputable seller of E's to order from online? jmoor2012 wrote: We've tried Petco and Petsmart, but both only listed Coenobita clypeatus on the signs and looked like all purple pinchers so we didn't look very hard. I didn't know that some E's may show up with them sometimes so we'll take a closer look at them. Does anyone know of a reputable seller of E's to order from online? As far as I know there are no reputable online crab vendors and I personally don't recommend or endorse ordering crabs from the internet. It took a long time to even come across E's where I live and we are in a huge metroplex, and since I do not purchase crabs-period, it took 3 years before coming across adoptable straws. I read the reviews on Nature Gift on Amazon, which sells live PPs. Those crabs are shipped in paper shavings. I’ve considered ordering from this company, but now I wouldn’t recommend them after seeing how the crabs are shipped. I would recommend to just keep going back and looking every time you see a Petco. The pet stores don't know what kind of hermit crabs they are getting or ordering. You are the one that needs to be familiar with what you want. Good luck! Be patient. They will come along. If you wait there might be a crab up for adoption on this forum. They most likly would come from a good home and would probably live. We have been searching the adoption pages, and even Craig's List for E's as well. We would much rather rescue then purchase, but still buy crabs on occasion. We always seem to have way better luck with rescues compared to store bought crabs too. Depending on where you adopt from, people won't even know they have Es. I think over the years I ended up with five or six Es completely by surprise from adoptions.